He is one of fashion's most iconic designers. 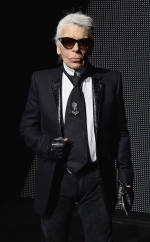 So Karl Lagerfeld was naturally a guest of honour on Thursday as he turned on the Christmas lights on Paris' Champs-Elysee where he was sporting his classic all-black look with trademark sunglasses and his white hair pulled-back. While he sported his usual look, the 85-year-old designer was transformed slightly as he displayed missing teeth while giddily beaming at the chic event.